I guess we can hope she still shows up and sells concealers to the audience. It's actually great that Rihanna isn't doing Coachella right after Beyoncé because she set the bar too high, whoever comes after her will disappoint. She can do next year hopefully with a great album released. I still have a good feeling about Januarih... and I'll give her to the end of Feb to be safe. I'll save my meltdown until March if R9 is still nowhere in sight. I have not posted in years. I use to remember posting so often but I still check up ukmix on the daily just to see if anything is new with Rihanna. I was listening to Rated R and I really cannot express my love for Fire Bomb, it’s such a timeless classic for me. If ever I have fan remorse for a song not being released it has to be this song. The lyrics, the productions , the feel and the vocals are just perfections. I started looking at reviews about Rated R and Anti, two of her so called becoming an artist albums and so many reviewers were so bias about her and her move into different darker tones. Yet these are the two albums were you see reviewers comparing other newer artists edgier albums. Coming to 2019, Rihanna’s ability to make dark, moody, haunting and soulful songs are so much more convincing from her beginning years. Her vocal ability has really grown in heaps and bounds. Close case love, love without tragedy, stay and fire bomb are such fan classics and deservedly so. I am really looking forward to the new vibe that she creates with R9...from a shakey limited vocalist to a strong vocal powerhouse with the ability to sing a song like Love on the Brain with such ease. Welcome back, sherman! I remember you from the LOUD, TTT and Unapologetic days. Good times. The more the merrier. Let's bring it on in 2019, Rihanna! Those years were the peak years of UKMIx. I want more music. We have already waited 6 days in 2019. Right? At least Mathew was a caring father and built up Bey's career by devoting his time and money on her. Ronald has been an absolute trash from the get go. Rih is most probably paying everything for him anyway and he thanks her for that by sabotaging her brand? The worst of the worst. 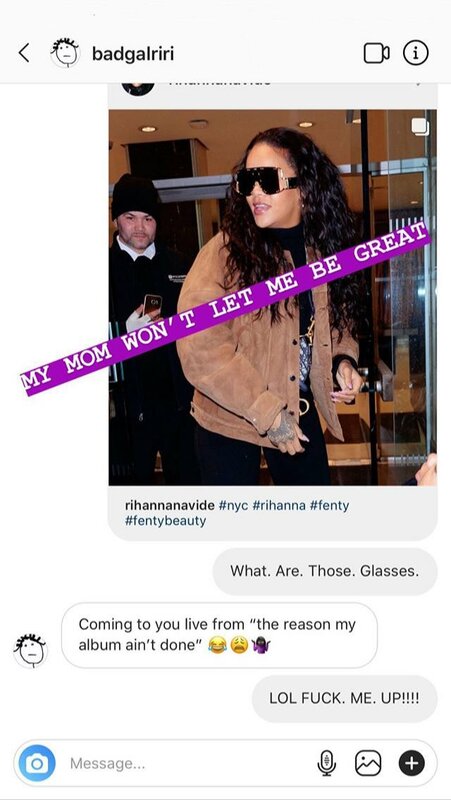 More FentyGlasses coming before the album. I think she's teasing us, i believe the album is complete and release date probably being set.